This post will be something of a departure from previous ones in that we’re writing it jointly. Though we met in 2008 and started calling our effort “Project Coyote” in early 2010, in many ways this week marks the 6th anniversary of our collaboration. It was the first time we visited the old search area together and everything grew from there. We’re an odd couple, with very different cultural backgrounds, personalities, and worldviews. There have been many strange ups and downs over the years but remarkably few major disagreements. One thing we’ve shared from the start is a similar approach to putting the pieces of this puzzle together – trying to glean what knowledge we can from those who were able to find ivorybills in the past, especially J.J. Kuhn. We think we’re on the cusp of obtaining something definitive for reasons that should become clearer in the post, if they aren’t already. It’s remarkable that we’ve come this far. The obstacles involved in documenting the ivorybill are enormous. We’re just two individuals with limited time and resources searching in a fairly large, remote, and challenging patch. We have a small circle of supporters and trusted people who visit our area when time allows. 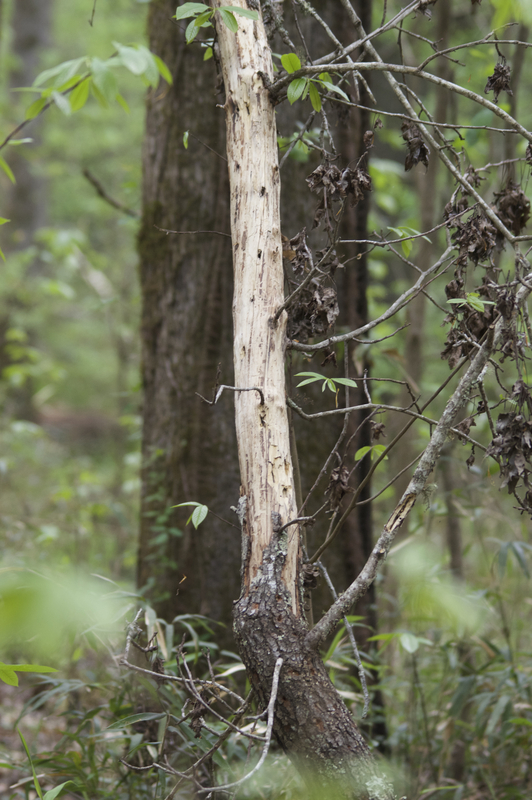 There are huge swathes of potential habitat in the southeast that get little human traffic, especially outside of hunting season, and many of these have not even been considered, let alone visited. It’s not uncommon for foreign (and some domestic) ornithologists to assume that conclusive imagery should have been obtained by now, just because it’s the US and birding is popular here and that extinction is likely because several organized searches have failed to come up with something definitive. Many American birders with little knowledge of or experience in the rural South jump to similar conclusions. The mere fact that there have been formal, funded searches matters very little. The difficulties in obtaining documentation of an extremely rare, wary bird species that requires a large home range in secluded, difficult habitat are monumental. We think that camera traps are the most promising avenue for obtaining something conclusive (as is frequently the case with cryptic animals). The problem has been to place the cameras in a location that birds are likely to visit. This has been our approach from the start, but it’s only now that we think we’ve solved the problem. While we will continue to use other methods and to host visiting biologists and trusted supporters, camera traps will be our primary focus in the coming months. On November 23, we were joined by Travis Lux, a freelance radio reporter who contacted us a few months ago and who has promised to keep our location confidential. We visited the downed sweet gum top discussed in several previous posts, most recently this one, and were elated to find that there was some new scaling at the top of the snag and decided that we’d return to Frank’s house to review the footage. As soon as we looked at the data stored on the card, our elation turned to alarm and then almost to despair. Travis had been recording the whole day, and we’re sure this will make for some dramatic radio. Frank will pick up the narrative to explain. Trying to understand what “goes wrong” with the various types of game cameras is a guessing game. Of the three cameras that we had deployed, two of them – upon reaching the 32 gb storage limit on the cards – began to overwrite the files rather than shut off automatically (as the instructions imply but do not directly state they should). The instruction manual was also misleading about the duration of a deployment based on the delay time set by the user. The instructions implied that a 32 gig card would not be completely full at the end of a 60 day deployment. In reality, the card filled up after fifteen days. The camera continued to operate, but it overwrote the earliest files with the newest files, rendering the earlier files unrecoverable. With this hard learned bit of knowledge, I increased the time lapse to ten seconds, from five, and cut out about 45 minutes of “on” time at each end of the day. According to the data gathered thus far and calculating data storage capacity vs. time deployed and time lapse setting, this SHOULD give us about 45 days with 50% battery and a fresh 32 gig card. The reprogrammed camera that we pulled the card on Mark’s last day in the field appeared to bear this finding out. With very few exceptions, these cameras are manufactured and assembled in The People’s Republic of China. The instructions (and this has been true of several different brands we’ve tried) are generally translated from Cantonese or Mandarin…Poorly. Fractured syntax, and confusing usage of common words often leaves the guy programming the camera guessing what the instructions REALLY mean. One of the cameras shut itself down for unknown reasons after taking just a few images. When checked, the batteries were still above 90%. I put a new card in it and conducted a 30 minute field test; it seemed to be functioning properly. Of the four cameras and three locations where we now have cams deployed, this one is in what we feel is the least likely to be visited by woodpeckers in the near future. Hopefully, the glitch will not reappear. To add to Frank’s comments, unless one has well over $1000 to spend per unit, there are major tradeoffs involved in selecting trail cams. The brand we’ve selected stores individual frames as the equivalent of deinterlaced video stills. This allows for greater storage capacity and longer battery life but lower image quality, especially at a distance. Fortunately, all of our current deployments are at close enough range to produce a definitive image or series of images, and we now know that the cameras themselves do not scare off whatever is doing the scaling, something we thought possible in the past. To return to the main topic, after the initial shock and disappointment wore off, we realized that there had in fact been relatively little scaling, except at the very top of the downed crown. The main trunk is almost untouched, and return visits remain a strong possibility. We have redeployed the camera and will leave it in place indefinitely. Tuesday the 24th was a more encouraging day. We were joined by Tom Foti, formerly of the Arkansas Natural Heritage Committee and a member of the Ivory-billed Woodpecker Recovery Team’s Steering Committee. Tom is perhaps the foremost expert on bottomland hardwood ecology. He was very impressed with the habitat. He jokingly commented that if he were still with the Arkansas Natural Heritage Committee, he’d try encourage his state to annex the area. While we were unable to show Tom any feeding sign, we did hear a couple of possible double knocks. In addition, we found a recently dead small sweet gum that had apparently been killed by ambrosia beetles, similar to others we’ve found, but as yet untouched. While there’s no suggestive feeding sign in the immediate vicinity, the location is approximately a mile from the camera deployment discussed above and a few hundred yards from where we recorded an apparent double knock and obtained several intriguing game cam images. Given the absence of recent scaling in the immediate vicinity, we think this is the least promising of the three current locations. We called it a day early because Tom had to return to Arkansas. What he saw and heard left him enthusiastic and eager to return. It’s a privilege to be around someone who’s so knowledgeable, and we look forward future visits and to learning from him. If the 24th was a good day, the 25th was even better, though considerably more challenging. Brian, Frank’s son, came along and helped carry some of Frank’s gear. We went into an area that we’ve only visited once before. The area is approximately 1.5 miles from the nearest road, and as it turned out, we did that three mile round trip twice. The habitat in this part of our patch is magnificent. There’s a good deal of old scaling high on live sweet gums. While this isn’t the type of work that we consider highly suggestive, it is consistent with what Tanner described and photographed (more on Tanner in Part 2). We found a huge and recently downed (leaves attached) sweet gum, part of which fell between two recently dead saplings that both showed signs of ambrosia beetle infestation. Some of the scaling on the huge downed gum seems consistent with Pileated work (having a layered appearance), and some of it comes close to what we think is diagnostic for ivorybill. This is the first freshly dead tree we’ve found that has feeding sign suggestive of both species. 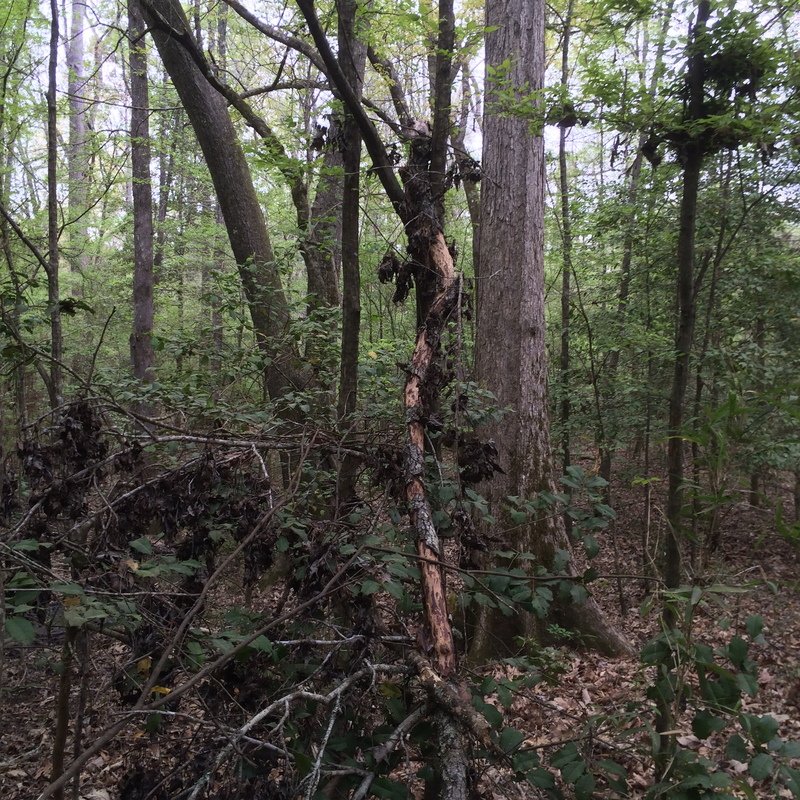 This Huge Sweet Gum Blowdown Shows Sign Suggestive of Both Ivory-billed and Pileated Feeding. After finding the sign, we decided the location merited our deploying two cameras. (It would take four or five to cover the whole blowdown.) Brian and I hiked out to retrieve the two that Frank and Bob Ford deployed in October, while Frank went back to his house to get additional cards. We hiked back in and reached the location at around 3 pm. Over the next hour, we heard several double and single knocks that seemed to be coming from no more than three hundred yards away. A couple of the double knocks were what we consider the best (most Campephilus-like) we’ve ever heard. We now have all four cameras deployed on recently dead trees or parts thereof that have a good chance of attracting woodpeckers in the near future. This along an approximately three mile line, with about a mile between each camera. As mentioned in the Part One of this trip report, I was alone in the search area from March 31st to April 2nd. Frank Wiley joined me from April 3rd-5th. He had a very robust, brief sighting on the morning of the 3rd, and we had a possible auditory encounter on the 4th. Conditions changed dramatically over the course of the week, and by the 4th, leaf-out had progressed to the point where examining tall trees for cavities and scaling had become very difficult. Weather conditions were generally good, although winds were high for much of the time. It rained heavily on the night of 3rd, and all we did on the 5th was set up a trail cam. I hiked into what we now think is a hot zone and worked my way south, finding approximately a dozen downed sweet gums and the standing sapling that had been heavily stripped of bark. I did several playbacks and got reactions from pileateds and red-bellieds – calling and drumming but not attractions. I called it a day when I found a secondary feather that I suspected might come from an ivorybill. It seemed large for a red-headed and was white, except for the base, which was black on both sides. I bagged the feather and hiked back out. Upon examination, it became clear that it was indeed a RHWO feather; the differences are subtle. The innermost secondary of the Agey and Heinzmann feather, which has been confirmed as an innermost ivorybill secondary, is 3.5” long (thanks to Fredrik Bryntesson for providing the information on this feather, which comes from a letter from Heinzmann to Wetmore) and is all white. I have seen an ivorybill secondary that is 4.25″, though I’m not sure of the number. It had black on one side. The difference is a very fine one, especially since the innermost RHWO secondaries also have black on one side and white on the other. This was false alarm, but better safe than sorry. The U.S. Fish and Wildlife Service’s Feather Atlas is a great resource; I only wish that it included the ivorybill. To my relief, nothing much of consequence happened on April Fools Day. I returned to the same area and did several playbacks over the course of the morning, generating increased drumming and calling from pileateds, red-bellieds, and red-headeds. The playbacks also seemed to cause Barred Owls and American Crows to vocalize, and after one series at 9:00 am, two crows came in silently to investigate and then called a little. I also found the “chopped” sweet gum sapling that day; it was within a hundred yards of the scaled sapling, in an area where there was an abundance of work on sweet gums. I visited three other locations. 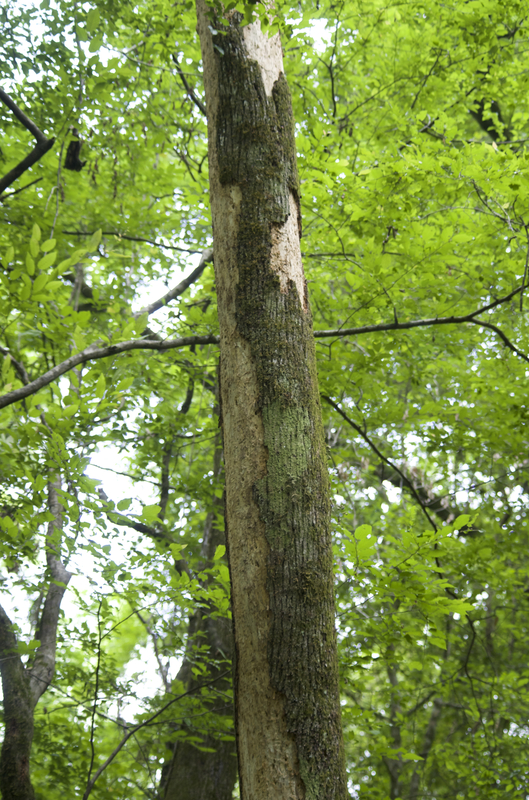 I began with the area where I found a concentration of bark scaling in 2012 and where I recorded calls in 2013 and where the tree on the homepage is located. The hydrology in this area has changed considerably for several reasons, and I saw nothing of interest. I did encounter a couple of large moccasins. Playbacks provoked some reactions from pileateds and red-bellieds. Strangely enough, the pileated did not respond to PIWO playbacks. I then went to another patch where there have been contacts over the years, and where we found a heavily scaled downed sweet gum last spring. There has been no further work on that tree, and the decay has progressed to the point where the bark is loose and Bess beetles, skinks, and slugs are residing underneath. This tree has now been down for between between one and two years, and the twigs and small branches are starting to fall away. The bark too is getting looser. Impressionistically, this is quite consistent with Tanner’s characterization of the decay process. 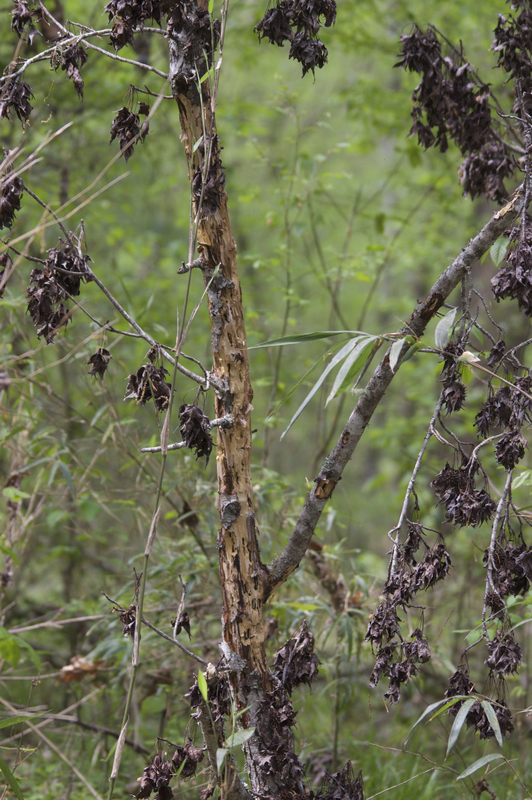 We suspect that this lack of return visits is typical of ivorybill feeding behavior, since we’ve monitored multiple feeding trees and have seen this pattern repeatedly. In one case, the small scaled oak in the old search area, there was one round of scaling found in January and a second in May or June, but in all the other monitored trees have been scaled once and that’s all. 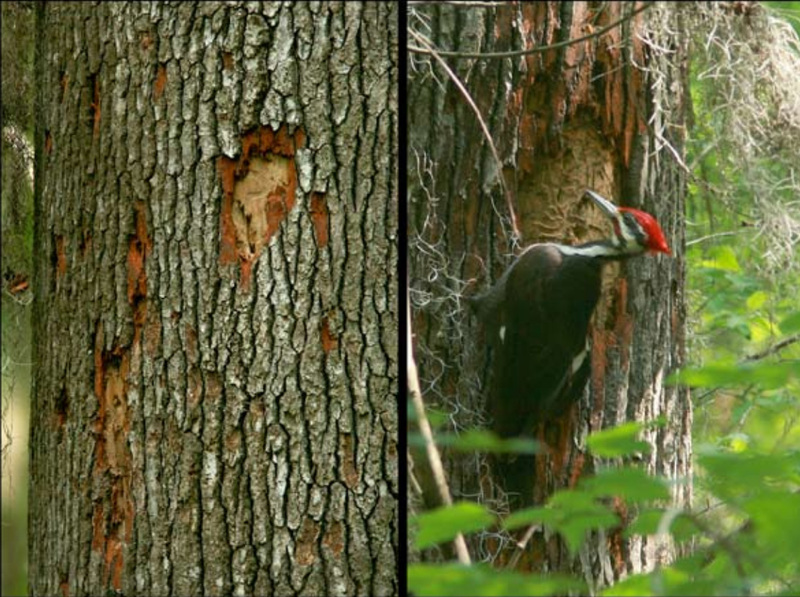 In my experience pileateds typically return to feeding trees on a fairly regular basis, and in the case of this particular tree, there’s obviously an abundant food supply under the bark. Frank and I hiked into the ‘hot zone’. We did some playbacks at approximately 8 am, although I did not record anything about them in my notes. We proceeded in a more or less southerly direction with Frank in the lead by about 10 yards; I was walking slowly and looking up and to my right. As we approached a body of water, Frank stopped and blurted something unintelligible. I caught up with him, and he said he had gotten a very good look at a male Ivory-billed Woodpecker that had flushed, presumably from a fallen log lying in the water or possibly from water’s edge. The distance was no more than 20 yards. I handed Frank my field book so that he could draw what he saw and record his observations. I’ve included the sketch and transcribed his description, with a few redactions related to the specific location. These were done immediately after the sighting and without reference to a field guide. Not included in the description is his estimate that the sighting lasted 2-3 seconds, as the bird, which was in the open for perhaps 10 yards (we’ll measure this distance at the next opportunity), flew upward into an opening in the woods across the water, and in his excitement, he mistakenly gave the date as April 4. Bright red crimson crest puffed up not what you’d expect. Stripe on face beginning behind. Stripes on back form chevron over rump. Wings long/thin shallow rapid flaps. Rear 1/3 to 1/2 of wings white, all the way out to primaries. Later that day in an email exchange, we added the following comments. “I just have a few things to add to this. I was about 30 feet behind Frank and was looking in the opposite direction, so I didn’t see it. Frank kind of blurted something, and when I got to him, he was clearly and deeply shocked and absolutely sure of what he saw. I told him to sketch it and then write a description. I didn’t hear any splashing or wood duck sounds, and I’m sure I would have if it had been a duck. He mentioned that he didn’t think the bird was terribly frightened and had probably flushed due to the sound of something approaching, since he was likely out of view. We were approaching the area where I found a concentration of bark scaling, including both the hatchet sapling and the other scaled one I found on Tuesday. (A better photo and a detail of a worked exit tunnel on that one are attached) and were perhaps 100 yards away. I had not mentioned this to Frank until after the sighting. It’s also not at all far from the cluster of old cavities we found last spring. I guessed that the bird was drinking from the creek, and we are contemplating putting a camera on the log, in the event that it’s a place that might be a preferred spot.” The only other item of note on the third was our finding an interesting looking old cavity in a fallen sweet gum. Though partially healed over, it appears to have been quite large when fresh, at least 6″x4″ and the area beneath it had been stripped of bark. We returned to the same general area on the morning of the 4th, covering a lot of territory and finding more scaling on downed sweet gums. At approximately 11 am, we heard a loud knock or knocks. Frank heard a softer first knock and a much louder second one. I only heard the second, but it was loud, sharp, and woody. It’s worth noting that though louder second knocks are unusual, they are by no means unheard of . . . “the second blow is louder in 21 out of 119 recorded examples of double-rap displays by seven Campephilus species we studied . . .” The knock or double knock had come from the northeast. We decided to do some playback, after which we heard two more possible double knocks in close succession, now from the west. I was not overly impressed by these, feeling they somehow lacked the energy I associate with really good knocks. Frank agreed about the first but thought the second was as good as any he’s heard. Slight differences in perception like these are not at all uncommon in our experience. On the morning of the 5th, we went out to place a trail camera where Frank had his sighting. We’re hopeful that this new higher resolution camera will provide unambiguous results. It’s worth noting that we flushed a Pileated Woodpecker from virtually the same spot and from a similar distance as we approached the water. There was no mistaking it, and within a roughy similar time frame, and with a virtually identical flight path, it was possible to note an equivalent number of field marks, including the facial pattern; we agree that this pileated appeared to be a female. Weather and lighting conditions on both days were similar with overcast skies, perhaps slightly darker on the morning of the 5th. Weather conditions were poor for a good part of this trip, but we did the best we could under the circumstances. I flew from New York to Louisiana on Christmas Day. During a layover in Dallas, I was uninterested in the food offerings in the terminal from which my puddle-jumper flight was slated to depart. I hopped on the tram to the international terminal and found a place to have lunch. There was a young guy sitting at the table next to mine, and we started talking while waiting for our checks. It turns out he grew up within 15 miles of our search area and thinks he saw an IBWO while hunting near his childhood home about ten years ago. I did not press him for details, but it was clear from the conversation that he knows Pileated Woodpeckers; I was also confident that he was sincere. Leaving the coincidence aside, it’s astonishing how many people in this part of Louisiana claim to have seen IBWOs in hardwood bottoms. During this trip, we also encountered a couple of duck hunters who were already aware of our search. One of them said, “If I saw one, I wouldn’t tell anybody,” which is considerably less worrisome than what I’ve heard people say in other places. The big concern for most is that finding IBWOs means the end of hunting in the area. We assured him that would not be the case. The thing for searchers to stress in this context is that success will mean that more forest is protected. On Friday, December 26th, Frank Wiley and I went to the northernmost sector, traversed a swath of tornado blowdown, and went to the site of our game cam. There is nothing of great significance to report from that day, except finding the somewhat unusual excavation discussed in this post. There is a good deal of old suggestive feeding sign in this area, but we found nothing fresh. We returned to the same location on Saturday and aimed two Reconyx cameras at the target tree that will be shown and discussed in an upcoming post that Frank is writing and will complete when he recovers from the flu. We hope that having two cameras in one location, with different orientations and shooting cycles, will yield better results than deploying just one. At a little after noon, Frank heard a single knock coming from the blowdown. It was followed by calling from a Barred Owl, a Pileated Woodpecker, and a Red-shouldered Hawk. On the full recording of the ensuing events, I can be heard saying “I thought I heard a knock out that way.” I had forgotten about this until I listened to the recording. Weak possibles are so frequent in our search area that I tend to dismiss them. The knock I heard must have come from the blowdown as well, since I pointed my camera in that direction. Frank did a double knock, and I recorded the “response” discussed in my December 27th post. We left the swamp ahead of the rain on the 27th, and it rained heavily through the 28th. On the 29th, we were joined by several biologists and divided into two groups. I tried to take my group to the area where I recorded possible ivorybill calls in March 2012, but water levels were too high to do much, so we went to explore some new territory to the northeast. A map of the logging history suggested that some of these woods would be very impressive, but in comparison to some of the other patches, we did not find this to be the case. There is a large area of blowdown that merits further attention, and we know the habitat south of the blowdown to be outstanding; there was a good concentration of old feeding sign near the edges of the blowdown. There are several other bottomland areas in the northern and northeastern sectors that we haven’t visited yet and that appear not to have been logged since the early 20th century (1905, 1910, and 1916). Frank took the other group into an area that has been surveyed a little more. One member of his team heard a weak possible double knock. On the 30th, the weather was cloudy, windy, and cold. We took our three remaining guests to the site of the game cams to give them a sense of the scale and the context for some of the images to be discussed in Frank’s post. The general view was that the blowdown might be an important area. We hiked out at a little after 1 pm, and two of our guests departed. We took our remaining guest to the easternmost sector, a narrow corridor of mature bottomland hardwoods around a smaller stream. This area has had concentrations of fresh scaling in past years. At around 3:30 pm, after doing an ADK series, Frank heard two double knocks a couple of minutes apart. Neither our guest nor I heard them, but approximately two minutes later, we both heard a distinct DK that Frank missed. We disagreed about direction but both thought it was more consistent with typical Campephilus double knocks than the one I recorded on the 27th, with a shorter intra-knock interval and a softer second knock. We had no doubt that it was a double knock on a woody substrate. On the 31st, Frank and I explored a mostly unvisited area, to the south of what Frank calls “Jurassic Park”. 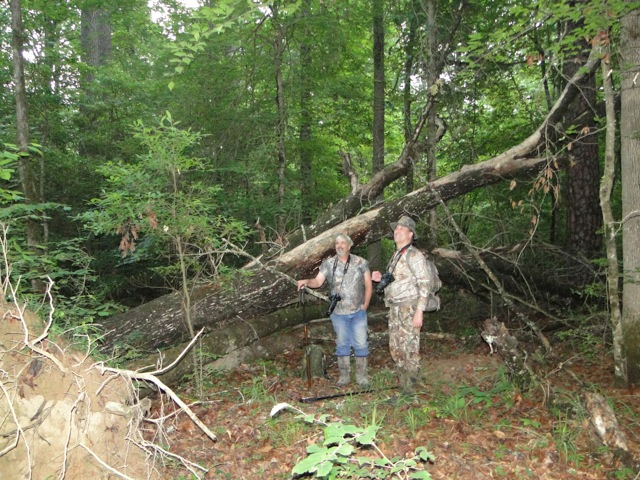 This is one of the widest swathes of bottomland hardwoods in the area, and it is very impressive; there are many patches of open canopy forest, with massive superdominant oaks and sweet gums like this one, which has a DBH of 4’2”. We’ve only scratched the surface in this very large sector (which includes Jurassic Park) that our history suggests was last logged in 1908. There was abundant scaling scattered throughout, mostly old, with one sweet gum (?) showing a large area of fresh work fairly high up. While this fresh scaling does not quite match the criteria for what we think is diagnostic, since it shows some signs of layered working and has a couple of small foraging pits, it is still quite extensive, and at least from a distance, the limb appeared to be live or very recently dead. Some large exit tunnels are visible on close examination. Also, while in this sector, we did an extended playback of the Singer Tract recordings. The playbacks did not generate any suggestive sounds, but several American Crows and two Red-Shouldered Hawks came in to investigate. The crows called, but the hawks did not vocalize. We don’t know whether the response of other birds to ivorybill sounds or imitations thereof is an indication of presence, but we are intrigued by it. It happens frequently in our area. Red-shouldered Hawks, in particular, react strongly to double knocks. Weather was a severe problem on this trip, preventing us from going into the field on December 27th, January 1st, 2nd, and 3rd. On the 2nd I made a brief visit to the area described by the man I met in the Dallas airport. I was reluctant to go off the main gravel roads in my small, 2-wheel drive rental, and there was no obvious public access to the narrow stream bottom. I drove through a recent clearcut of about 40 acres. This looked to have been a stand of mature hardwoods. There is some measure of connectivity with our search area, and there are numerous smaller riparian corridors in the region. If birds are breeding in this part of Louisiana, there are ample possibilities for movement and dispersal through habitat that is not quite as impressive. I recorded this today in the northern sector. The first sound is Frank Wiley’s double knock with cypress dowels on a tree. The response comes approximately nine seconds later. There was no human activity in the vicinity at the time, and the spectrogram makes it clear that the source is natural. The intra-knock interval appears close to what would be expected for a large Campephilus woodpecker, approximately .11 seconds. This was at a site where we’ve now got two cameras deployed. Frank will be posting a discussion of the pros and cons of game cams in the near future. Edited to provide more context: I should have included this potentially significant detail – prior to my turning on the camera, Frank Wiley heard an ambient single knock that I missed. This was followed by agitated calling from a Pileated Woodpecker, Barred Owl vocalizations, and scolding from several Red-headed Woodpeckers, all of which I heard. The single knock gave him the impetus to do a single ADK. Thus, the circumstances were somewhat different from the typical use of ADKs as an attempt to attract or generate a response. On further edit 12/31: I’ve modified the title from “. . .Apparent Double Knock in Response” to “Apparent Double Knock in Apparent Response” to correct the logical fallacy in the previous headline.